Restaurants validate parking with receipt. 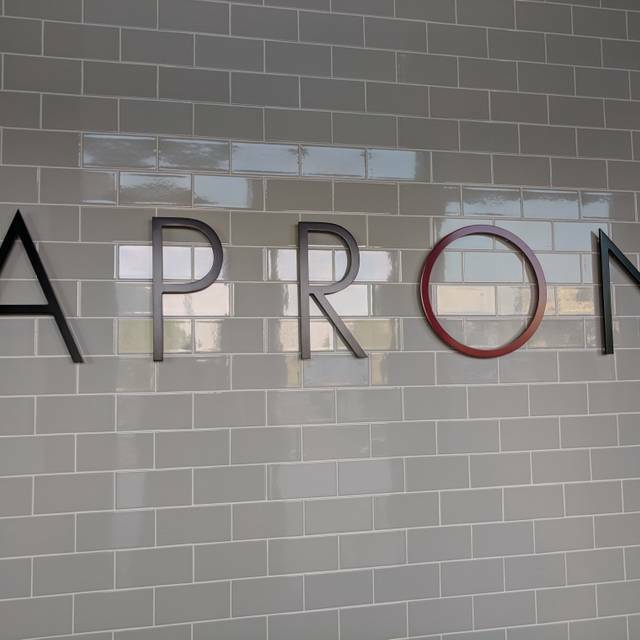 Apron is a vibrant bar and restaurant featuring Mediterranean-inspired dishes made with regionally-sourced seasonal ingredients. 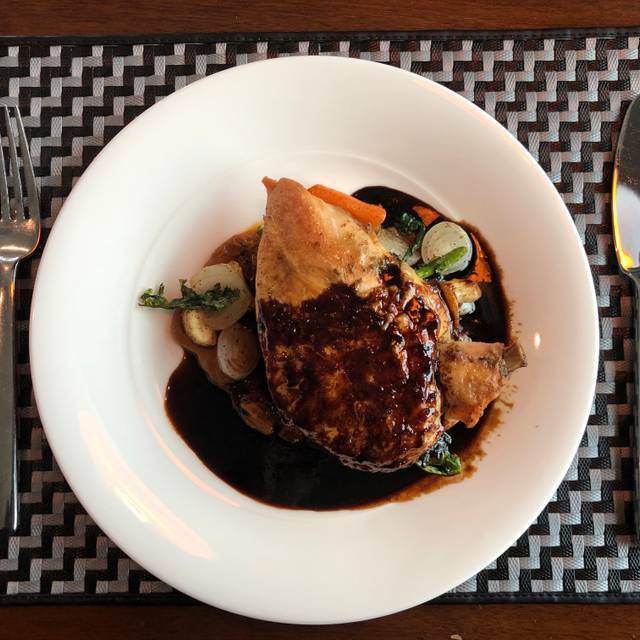 Our menu is complimented by an extensive selection of signature cocktails, wine, and local craft beers. Drop in for a quick lunch, enjoy a refreshing drink at the bar, or settle in for a meal with friends, we're conveniently open Monday thru Sunday for breakfast, lunch, and dinner. When the weather abides, join us for a tasty bite and a refreshing cocktail on our comfortable outdoor patio. Mother's Day buffet with carving and omelet station, with fresh pastries and so much more. We will be open from 11am to 3pm. Reservations recommended. $68 for adults and $25 for children under the age of 11. 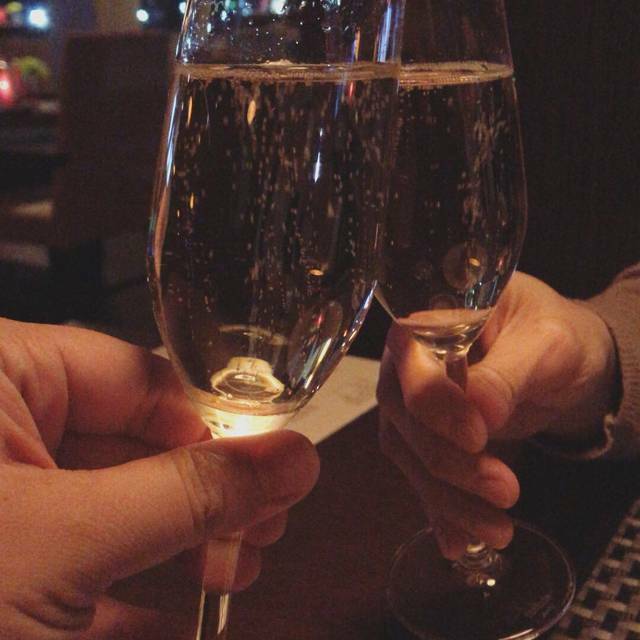 Complimentary Champagne cocktail for mom. Me and my wife went to Apeon for our anniversary dinner. The food was really good. The Brussels sprouts were very good and the Brezino was incredible and Agnes is probably the best waitress of any experience we’ve ever had. She designed Happy Anniversary on our desert plate. Thank you for a memorable moment. 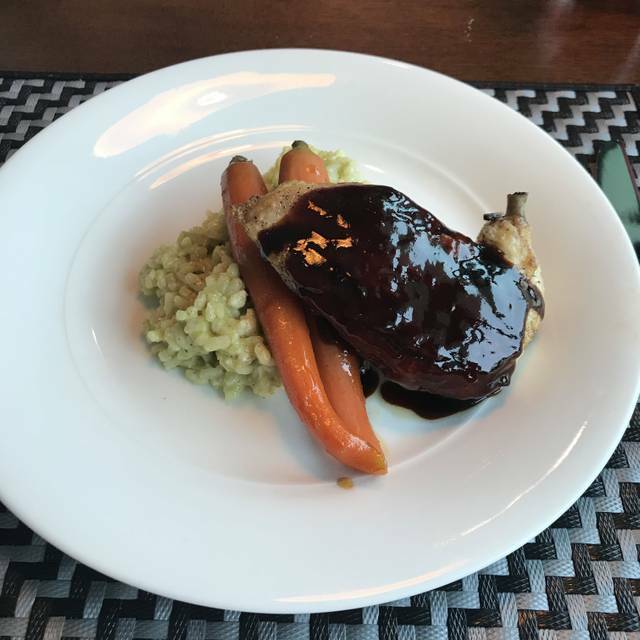 Apron is what you would expect of the flagship restaurant in the airport area's only 5-star hotel. Drinks, food, and service are all excellent. My only negative comment is I was a little peeved to find a $8 charge on the bill for one of our parties birthday dessert, which we did not exactly order. Apron was amazing, the Braised Lamp Shank was so tender and delicious!!! Our waitress was a little Asian lady and she just made our dinner experience at Apron outstanding. We will be back and bring some of our friends. Thank you for a wonderful dinner. Our meal was very good. The service was slow due to our waitress also taking care of several large groups We chose this restaurant because it is located next to the Porsche Experience that we were going to. Had a simple lunch which included a burger and side salad. Both were good although I was distracted by another dish that I saw (shrimp and rice) and that I plan to try on my next visit. Decent food, out of a lot of dishes, and service only fair. This was the strangest dining experience. We went on a Friday night around 6:30 and the restaurant wasn’t very crowded. Yet, they were sold out of most of the items we tried to order off of the main menu. Very frustrating as it is not an extensive menu by any definition. What we were able to order was delicious including the drinks! The hostess and manager were fantastic but there did not seem to be enough wait staff as it took ages for our waiter to come over to greet us. From what we were told, this was a new menu and under new hotel management by just around a month. If I found myself back in the area I would try it again just to see if it improved. Service was good, food selection was limited. Fantastic dining experience and great service. Agnes, our waitress, was a delight. She made our experience a memorable one. Ask for Agnes! Agnes from Singapore. She was very friendly and professional. We learned a lot on our first dinner date experience. It’s a valet only parking service. The live music played by the musician was also very nice. We loved it. Fantastic restaurant if you are looking for exceptional service and wonderfully prepared entrees, a little on the pricey side but well worth it. Why 3 stars? Because Apron was good but has the potential to be better with some fine-tuning. Having read the Yelp reviews, most of which were very positive, my wife and I decided to give Apron a try. The restaurant is beautiful and is located in the brand-new Kimpton Hotel. 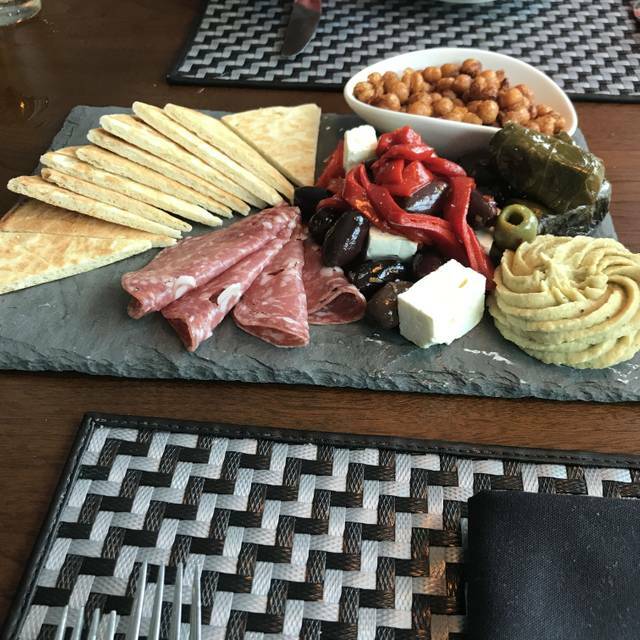 The menu has a heavy emphasis on Mediterranean cuisine, which we love, so we were excited to see their interpretation. We started with the dolmas, which are traditional grape leaves that are filled with rice and spices. Apron's version came out warm - in a nice ramekin with a lemon buerre-blanc. It was delicious! We each had a glass of wine; their wine and drink menu is very expansive and creative, and wines by the glass are reasonably priced; Justin Cab @ $16 and a nice Latour Chardonnay for $16. For our entrees, my wife ordered the burger, and I ordered the gyro; the former is a word-wide standard, the latter is, of course, a Mediterranean classic. Here is where things got slightly off track. My wife liked her burger, but it did not come with any condiments for it or her fries, and we had to ask several times - and wait about 5 minutes. My gyro was not a classic gyro, but it was still good. Let me explain. 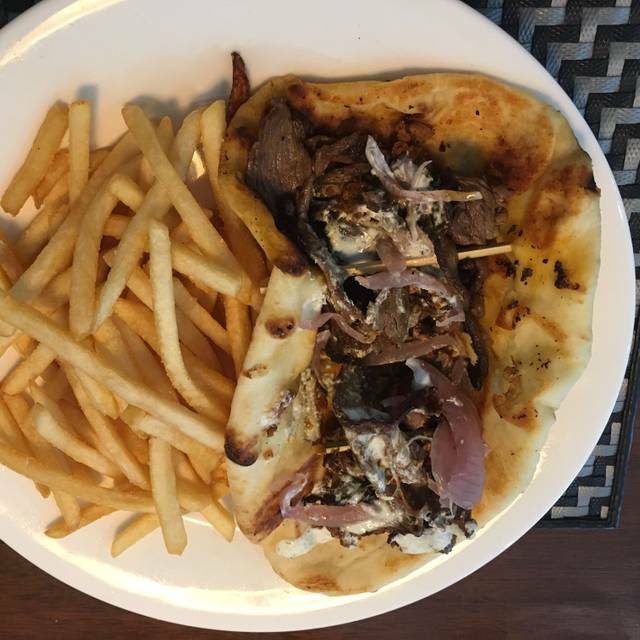 If you've ever had a gyro, you know it is a grilled pita filled with lamb (typically shaved), lettuce, tomatoes, and tzatziki. Apron's version was...dry! The lamb was very tasty & seasoned very well. But there was no lettuce, no tomatoes, and only a slight drizzle of tzatziki. I asked for tomatoes and more tzatziki, and this saved the dish. We spoke with our server who said that tChef used to serve it the traditional way, but some people did not want or like the tomatoes and lettuce. My suggestion is that Chef return to the classic preparation and perhaps compromise and serve the lettuce and tomatoes on the side...and definitely add some more tzatziki. Great food, great service! We loved our server! Disappointed. Seems that they are under new management. The food is still very good but the menu is very limited. Great airport location. Service and food were very good. Excellent Ambiance and excellent Service. I was not too impressed with the food but that’s because I am foodie and very picky. The preservation however, was excellent. Apron was fantastic as always. The service Isabell delivered was superb. First experience eating at the Apron. Great service and wonderful cuisine. Enjoyed the view and the ambience. Was at the restaurant for a business luncheon and the environment was perfect. Will definitely return. Sunday evening family gathering. Beautiful hotel lobby, easy access from the airport. 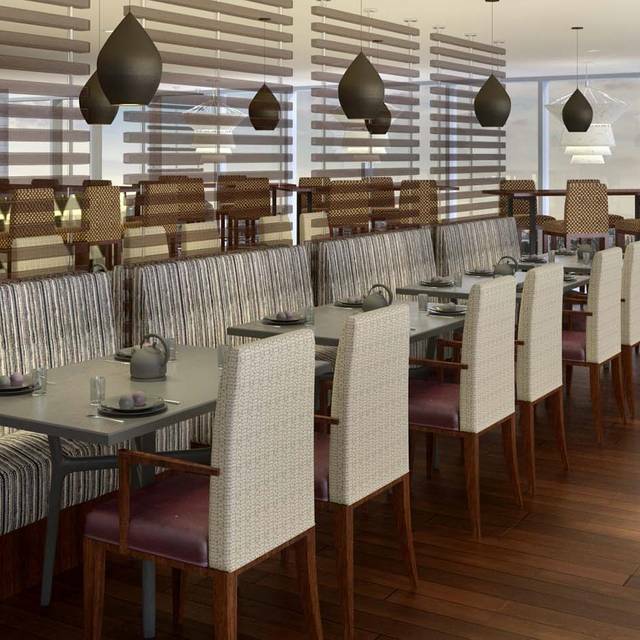 Restaurant is spacious, modern with a generous bar and sitting area. It is quiet. The menu is ample with reasonable prices. Both hostess and waitress couldn’t have been more polite and professional. We had a terrific family gathering. Celebrating my husband’s birthday with a Porsche Experience and ending our night with a nice meal at Aprons. The cocktails were awesome and we both enjoyed our meal choices. The great service and live music complimented the meal and added to a perfect birthday celebration. It’s a nice addition to the area and far exceeds most hotel restaurants. Nice ambiance and excellent food. Will return again. Good food, great service. 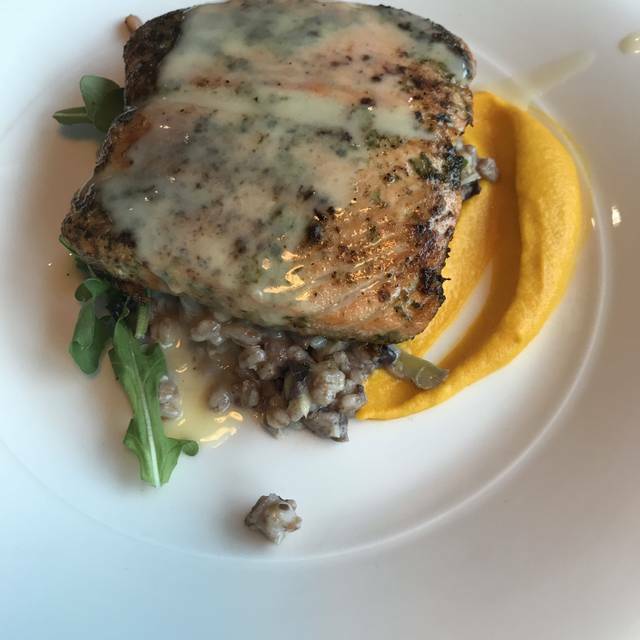 Wife said that the steelhead trout is to die for. My pasta was a real winner. Food was fabulous. Only reason it wasn’t all 5 stars was the service was really slow. My waiter Stafford was a gem. Attentive to all of our needs and he also brought the birthday girl an awesome cake! I hosted a group of 6 for dinner to celebrate my husbands birthday. The semi private room was perfect and allowed us the opportunity to have great conversation while also enjoying the live music. After dinner we moved to the bar where we continued to enjoy the live music. The food, the service and the ambiance was excellent. The branzino was phenomenal! Service was a bit slow and with the live music it was too loud for us. But the fish was so good id go back! The food was very good. I ordered the branzino (fish) and it was cooked perfectly. The only thing that I was disappointed on was the ambiance as I expected it to be a tad more swank given that it is in the lobby of the Porche Hotel (Hotel Solis). It is your standard hotel lobby restaurant. Please don't let that deter you from going to Apron as the food and service are great. Stafford our server was awesome. Very attentive. The food was Devine. The burger was fantastic without any condiments. It was that good! Had a fabulous time here with 5 business colleagues. Agnes was by far one of the best servers I have ever had and I dine out a lot! Will definitely return when back in the area. Kudos to the staff of Apron. What was about to turn into an unacceptable dinner for our 4th anniversary, the staff and manager made it right. We look forward to dining with you. Thank you to the restaurant for rising to the occasion and making things as right as you possibly could. One of the best rooftop places in Atlanta on the south side. Food bad , over cooked took 40 minutes . Tried breakfast in morning and the eggs Benny had so much vinegar in it you could smell it. Hotel is great food was miserable . Service and attempt to make it right , staff was amazing and nice. service is slow but food is great and atmosphere is good too. The servers are very kind and knowledgeable it just takes a long time for your food to come out to you. Would not recommend for a lunch hour.